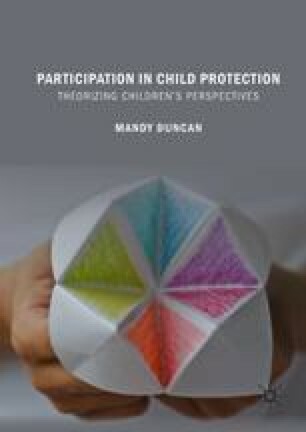 This chapter is based on in-depth interviews I conducted with three young people in relation to their experiences of participating in the child protection system. Madison and Jayden were both aged twelve at the time of the interviews which took place at regular intervals over the course of their involvement with statutory child protection services. Grace was a young adult the time of interview and reflected on her prior involvement with the child protection system at the age of fifteen. Madison’s and Grace’s stories are presented in their own words as much as possible. Jayden has learning and language disabilities including Attention Deficit Hyperactivity Disorder (ADHD) and Dyslexia. He refused consent for our interviews to be audio recorded and therefore his story is told mainly in my words with some direct quotes from him.